Russia's Chelyabinsk Pipe Plant (ChelPipe) Group PJSC has signed a contract for shipping more than 150,000 tons of large-diameter pipes (LDP) to Turkmenistan's Turkmengas state concern for the construction of the linear part of the TAPI (Turkmenistan-Afghanistan-Pakistan-India) gas pipeline, Trend reports referring to the press service of ChTPZ. The first delivery of steel pipes with a diameter of 1,420 millimeters with an external anti-corrosion coating will take place during the second quarter of 2019. It is expected that about 200 kilometers of the TAPI gas pipeline passing through the territory of Turkmenistan will be laid out of pipes provided by ChelPipe. "Within the framework of the TAPI project, the company will ship the largest batch of LDP over the past few years to Turkmenistan. ChelPipe has offered the best delivery and service conditions among 94 companies from Russia and the world that participated in the tender," the press release said. For the implementation of the project in accordance with the requirements of international and Islamic banking, its financing was provided by 3 financial organizations. Among them was Russia's Sberbank – a state-owned Russian banking and financial services company and a partner of ChelPipe, as well as the Islamic Development Bank (IDB) and the State Bank for Foreign Economic Affairs of Turkmenistan. These institutions organized international cooperation and structured the deal confirming the obligation to pay for the pipe worth over $200 million, the report said. Construction of the Turkmen section of the TAPI, with an annual capacity of 33 billion cubic meters of gas, was launched Dec. 13, 2015. The IDB issued a loan for Turkmenistan in 2016 to finance the construction of the Turkmenistan-Afghanistan-Pakistan-India (TAPI) gas pipeline. An agreement worth $700 million was signed with the State Bank for Foreign Economic Affairs of Turkmenistan. Turkmenistan supplies gas to China and Iran. The ChelPipe group at one time shipped large-diameter pipes for the construction of the third stage of the Central Asia-China gas pipeline. ChelPipe Group is comprised of ferrous industry enterprises and companies including: Chelyabinsk Pipe Plant; Pervouralsk Pipe Plant, a warehouse complex selling the Group's tubular products in Russian regions, RIMERA Group oilfield services provider; META scrap metal procurement and processing company; Pipeline Bends, ETERNO and MSA (Czech Republic) manufacturers of main-line equipment. ChelPipe's main goal is to fully meet the needs of Russian and global fuel and energy companies through the development and delivery of integrated solutions for main-line and intra-field pipeline transport. 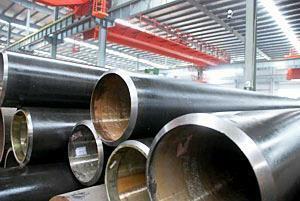 With its sufficient capacities for the production of a wide product range of welded and seamless pipes, as well as its highly developed warehouse system, ChelPipe Group is poised as an effective universal player on the Russian and CIS pipe market, offering tubular products for all major economic sectors, as stated in the group's website.